Click on image to see a large version of the painting. I tell you, seeing something from one of my stories being turned into a breathtaking piece of art like this has been one of the best things about Black Tat getting published. 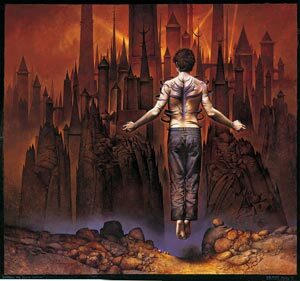 And although the UK and US editions make use of the painting in different ways, I think they're equally striking. 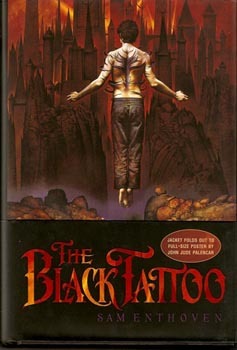 UK first edition. ISBN 0385609655, published 6th September 2006 by Random House Children's Books in their Doubleday imprint, in hardback, rrp £12.99. This hardback edition sports full colour endpapers, reproducing Mr Palencar's painting as the first thing you see when you open the book and the last thing at the end before you close it. In addition - though it's a little difficult to make it out here - the dramatic black jacket is made more dramatic still by an array of 'spot-polished' tattoo shapes radiating out around Charlie(the boy)'s back. Shiny black against the surrounding matt finish, this effect is, frankly, very cool indeed, and glittering gold on the title and spine rounds it all off. Stunning! 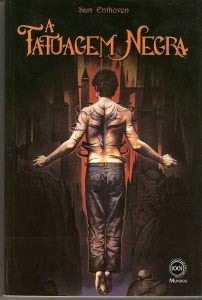 US first edition. 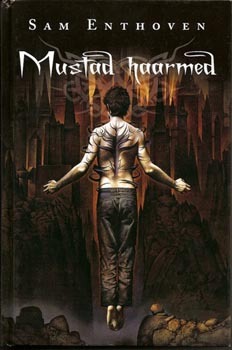 ISBN 1595141146, published 5th October 2006 by Razorbill, an imprint of Puffin US, hardback, list price $19.99. Again, it's not easy to make out from my pic here - you have to see it in the flesh! 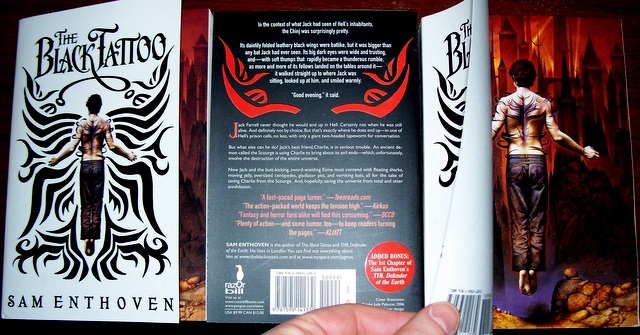 - but the US hardcover edition of Black Tat includes something I've never seen before. Due to an incredibly cunning piece of design, the jacket strips off and folds out into a poster - a gorgeous, glistening copy of Mr Palencar's painting of your own, to put on your wall. Innovative and funky interior page design by Razorbill's in-house layout genius Chris Grassi (who provided the same fonts for this website - thanks, Chris!) complements the whole, making this edition of Black Tat a very, very nice item. In fact, both editions of the book are so beautiful that I really don't know which is my favourite. Unabridged audio edition. ISBN 0739336754, published 10th October 2006 by Listening Library. 11 compact discs, 13 hours 57 minutes, list price $50.00. 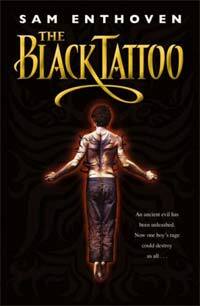 Next up, we have the US audio version of Black Tat, masterfully read - all the way from start to finish! - by John Lee. Hearing someone else interpret your words is quite a strange feeling, you can imagine, but I have to say, I couldn't be happier with it. Mr Lee clearly threw his heart into the recording: his voice characterisations (particularly his ones for the Chinj, Gukumat and the Dragon) are just fantastic! Spanish language first edition. ISBN 8466629564, published December 2006 by Ediciones B, translated by Cristina Martin Sanz, hardback, list price Euros13.95. According to the title page, Ediciones B have offices not "just" in Spain, but also in Colombia, Argentina, Venezuela, Mexico, Uruguay, Ecuador and Chile – which gives you an idea of just how far around the world this edition could go! Pretty thrilling, eh? HEE HEE HEE! UK paperback. ISBN 9780552553582, published 2nd August 2007 by Random House Children’s Books in their Corgi imprint, rrp £5.99. 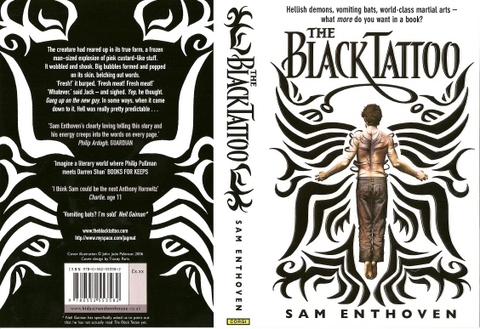 This is what the paperback edition of Black Tat looks like in the UK and associated export territories. Striking, no? The tattoo pattern and the text on the front cover is all embossed, pushed outwards, giving a really tactile feel to it - very satisfying to pick up and hold. 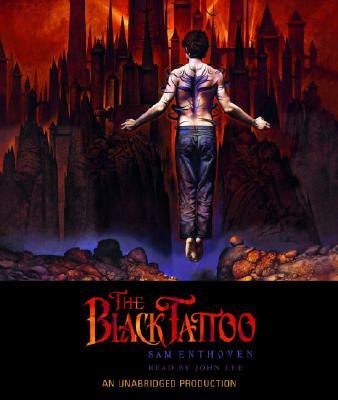 The way the tattoo is spreading its dark influence across the white background – even the way the shape suggests the butterfly scene – it's all very cool, and I’m very, very excited! US softcover. ISBN 9781595141330, published January 2008 by Razorbill, an imprint of Penguin US, list price $9.99. 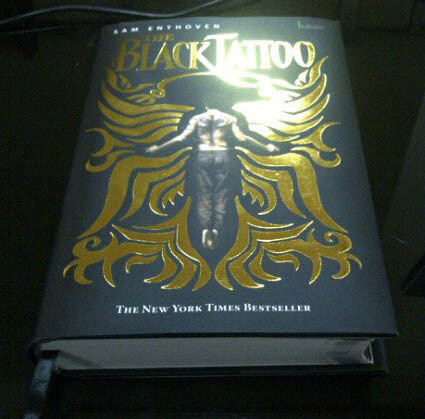 Here's the US paperback of Black Tat. As you can see, the front cover is closely based on the wonderfully eye-catching design that the Random House Children's Books team came up with for the UK version. The US edition is a little larger however; the awesome US page-layouts have made it into the new format in their full glory; the first chapter of Tim [also available here] is included at the end – and yes, there's one other feature, namely a full colour version of Mr Palencar's beautiful painting, on the first page! In short? I think it's terrific. HURRAH! Estonian language first edition. ISBN 9789949442416, published 9th July 2008 by Pegasus, translated by Tene Hook, hardback. 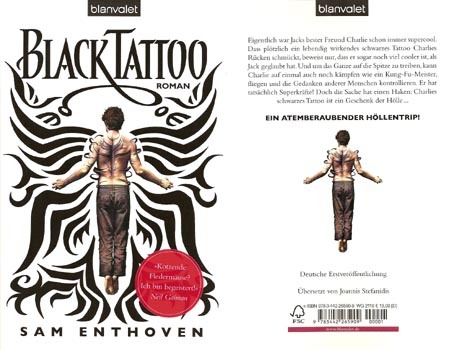 This is the Estonian edition of Black Tat, and it's a particularly gorgeous item: a hardback, with full colour endpapers. 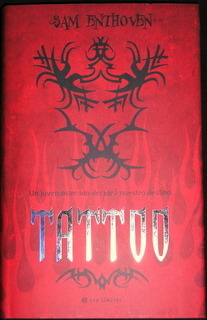 Check out that watermark-like tattoo pattern around the title! Portuguese language first edition. ISBN 9789895574483, published September 2008 by Edicoes Gailivro, translated by Dulce Andrade Aleixo, large format paperback, list price Euros17.90. German language first edition. ISBN 9783442265909, published October 2008 by Blanvalet, translated by Joannis Stefanidis, paperback, list price Euros13.00. As you can see, like the US paperback, my German publishers Blanvalet have gone for the classic black on white look first developed by the design team at Random House Children’s Books UK (yay!) - isolating the figure of Charlie [actually posed by Mr P's son, Ian, fyi!] from John Jude Palecar's awesome painting. But that red sticker on the front is a cheeky new twist! If you can't read it, it says "'Kotzende Fledermause? Ich bin begeistert! 'Neil Gaiman". For a translation of that quote - and the story of how I got it! - check out the TIM interview page. Hee hee hee HEE! 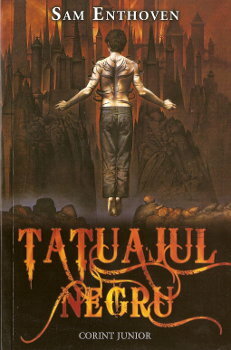 Romanian language first edition ISBN 9789731282930, published 2009 by Corint Junior, translated by Sorin Voinea, paperback. Indonesian language first edition. ISBN: 9799791122717, published Feb 2011 by LiniKata, hardback. The only responses I find myself able to make right now are WOW! and HEE HEE HEE HEE! I'll do my best to put up full details of any more incarnations of Black Tat just as soon as I can. On with the sinister masterplan!